Attempting to solve the Rubik’s cube for the first couple of times can be quite daunting without any help. However one innovative maker Francesco Georg, has used a little LEGO together with a Raspberry Pi mini PC to create an awesome Rubik cube solving machine. 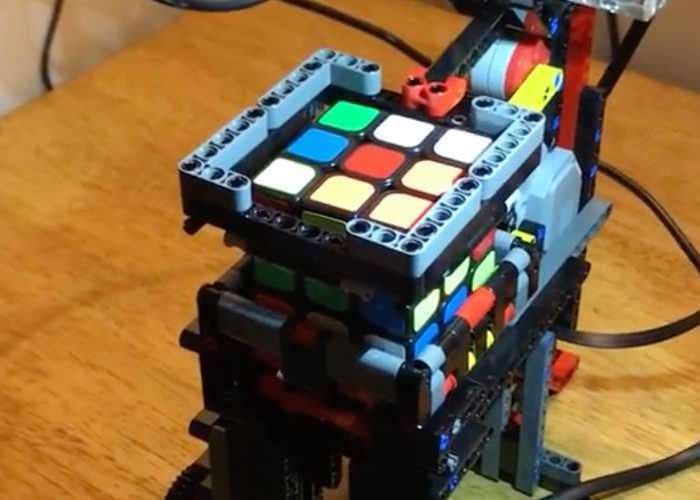 Built using LEGO Mindstorms, the Raspberry Pi, and BrickPi the machine uses the Kociemba two-phase algorithm to solve the Rubiks Cube, which can be seen int he video below. In a classic Rubik’s Cube, each of the six faces is covered by nine stickers, each of one of six solid colours: white, red, blue, orange, green, and yellow. In currently sold models, white is opposite yellow, blue is opposite green, and orange is opposite red, and the red, white and blue are arranged in that order in a clockwise arrangement. On early cubes, the position of the colours varied from cube to cube. An internal pivot mechanism enables each face to turn independently, thus mixing up the colours. For the puzzle to be solved, each face must be returned to have only one colour. Similar puzzles have now been produced with various numbers of sides, dimensions, and stickers, not all of them by Rubik.